It was two or three days into my holiday in Bologna with my family that I noticed the small marble plaque on the outside wall of the building abutting our hotel. And this was not just because we were spending every awake moment thinking about what to eat next in Bologna. We were, of course. The Italians don’t call Bologna ‘La Grassa’--the fat one--for nothing. Is there another city in the world where such a high proportion of restaurants rate 4 out of 5 stars or better on Google? But this little plaque is no bigger than a couple of paperback novels placed spine to spine. It is white with a black border and has no more than five lines of text on it. Not only is the plaque quite small, but it is also mounted high up on the wall between a barred window and a small mailbox. Unless you look up as you walk past under the portico, there is little chance you’d spot the memorial to Walter Stefani who died in 1944 aged just 25. And even if you did spot it, the chances are you really wouldn’t care. There are bigger, brasher, more luminous things to look at in Bologna. But I was suddenly taken by this young man. Who had died during the second world war. And was some kind of partisan. Who was Walter Stefani, I asked the lady who manned the hotel reception. She shrugged her shoulders. He must be one of the boys the Germans shot during the war she said. So I googled him up. One Walter Stefani was a writer from Vicenza had just died recently. Not him. And another Walter Stefani was a plastics entrepreneur. Not him. And then I finally found him. Walter Stefani. On the ‘Storia E Memoria De Bologna’ website, a portal on the ‘history and memory’ of Bologna run by the city municipality. Walter Stefani. Son of Ernesto and Ida Zani; born on 2 December 1919 in Sasso Marconi, a town 17 kilometres southwest of Bologna. There is precious little about Walter Stefani available online. And the little there is mostly in Italian. Running the handful of sources through Google Translate tells the story of a simple man who went out in a blaze of heroic glory. Walter Stefani was a young man who was a fan of Bologna FC in his childhood. For several years, according to more than one source, he was Bologna Football Club’s ‘first mascot’. It is unclear what this means. Regardless Stefani was associated with the club when it was going through its brightest patch. They became national champions twice in the late 1920s. And then after the establishment of the Serie A, they won four more times before the onset of World War 2. Stefani was a delivery boy or a bellboy, or both, at the outbreak of the war. Then on the 1st of May 1944, he joined one of the many Italian resistance groups that sprung into action following the 1943 armistice between the Kingdom of Italy and the Allies. The Germans responded to this perceived treachery on the part of their erstwhile allies by turning on Italian troops and eventually invading and occupying Italy. All over the country resistance and partisan groups began to sprout up and engage the Germans. Bologna became one of the main cauldrons of this resistance and witnessed some of the most significant engagements between German troops and resistance fighters anywhere in Europe. And as the Allies took Rome and marched northwards, these resistance fighters were further motivated to do their part in undermining German resistance. Stefani himself joined one of the most storied partisan groups that functioned in the Emilia-Romagna region around Bologna. Called the Stella Rosa (Red Star), it later became known as the Stella Rosa Lupo brigade after its leader Mario Musolesi aka ‘Lupo’ or the wolf. The charismatic Musolesi had put together the brigade from a ragtag group of fighters with diverse political beliefs and even some Allied POWs who had been freed from captivity. Surely the most remarkable of these fighters has to be Sad Singh, a Sikh officer from New Delhi. Attached to a tank regiment in the British 8th Army, Sad Singh had been captured by the Germans during the Allied invasion of southern Italy. But Singh escaped, hid aboard a train from Florence to Bologna and then joined Stefani’s Red Star Lupo brigade. Perhaps he fought shoulder to shoulder with Walter Stefani. If Lupo’s fighters were looking for a chance to hurt the Germans they soon got it. In August 1944 the Germans drew up a defensive line in the Monte Sole regions south of Bologna. This was precisely where the Red Star Lupo fighters were ensconced. The Germans knew they had to neutralise the partisan and resistance fighters in order to keep their lines intact. But what they eventually carried out was nothing short of a war crime: a massacre of the villages of the Monte Sole. Of the 2000 population of these villages the Germans killed some 800 including h216 children, 316 women and 142 ‘elderly people’. Walter Stefani himself did not die in Monte Sole. Instead, he was captured and taken prisoner. Then on 20th September 1944 Stefani along with ten other prisoners were taken to a shooting range on the Via Agucchi, to the northwest of Bologna not far from where the airport is located today. Twenty-five year old Walter Stefani was executed. Four days later a local newspaper reported his execution and declared that all eleven victims had confessed to acts of terror against German soldiers. Stefani’s remains are interred at the Ossuary Monument to the Fallen Partisans, inside the monumental Certosa Di Bologna cemetery complex. Today there is a plaque outside a house on a narrow little alley in Bologna that reminds us of the supreme sacrifice young Stefani made for his country and his beliefs. His life as a partisan was short. He signed up in May 1944 and he was dead just four months later. On 21st April 1945, Bologna finally passed into Allied hands. When we read great histories of the Second World War, or indeed any great endeavour, we are often swayed by the portraits of the great men and women. The presidents and generals and dictators and emperors. The lives of the small men and women often pale in comparison. Walter Stefani is no Eisenhower. Thevarthundiyil Titus, Anand Hingorini and Ratnaji Boria are but minnows next to Mohandas Karamchand Gandhi. Yet if they hadn’t been amongst the first 80 to march alongside Gandhi, his Dandi March may have hardly become the turning point in Indian history that is. But this is not just a matter of remembering the forgotten. Small plaques outside obscure homes on narrow alleys are also objects of empowerment. They remind us that sometimes giants stand on the shoulders of minnows. Walter Stefani helped defeat fascism. Around 11 pm on the 15th of June 1990, my mother woke me up in the vigorous fashion that she used to. "Wake up Sidin wake up wake up wake up wake up. Enough of sleeping like a wild buffalo. Wake up wake up." As far as I know my Malayali family has never owned a wild or domesticated buffalo. Cows? Yes. Chickens? Very much. Rabbits? For a brief period. Turkeys? Yes, and hilarious. Venomous snake in the copra warehouse? Unintentionally. But buffalo? Never. We've never owned them. And I highly doubt if my mom ever spent any time observing their sleep patterns. And yet here she is insinuating that I sleep like one. But uniquely, on that night, I woke up instantly. We rushed to the living room, switched on the TV, and promptly sat down to watch West Germany versus UAE at the 1990 World Cup. My mom and I were excited beyond description. UAE. UAE! Our UAE! At the football world cup! And playing against Germany! How is this possible? Is this real life or just fantasy? Etcetera. We were super excited. So some 1980s-NRIs might remember a time when policemen used to speak a bit of Hindi and a little Malayalam. And when the emaraati at the customs counter would ask you if you had 'coconut halwa' in your luggage, and when they trusted the Indian fellow in accounts--aka Dad--so much that they let him draw up all the cheques, which they would sign with merely a cursory glance. Dad: "Please sign here sir." Ancient bedouin boss uncle whose Welsh-educated kids ran the company, but who still insisted on dealing with all money himself: "Oh Mr. Sunny very big amount eh? Very very big..."
Dad: "Sir, that is the date. This is the amount." Boss: "Inshallah company is in your hands Mr. Sunny." So anyway. We were unbelievably excited. And on June 15th the UAE faced West Germany. They'd already lost to Colombia previously. But a match against West Germany? United Arab Emiridiciulous level of hype. The Germans quickly put two past UAE goalkeeper Muhsin Musabah. Did this do anything to undermine the electricity coursing through the veins of mother and son? Absolutely not. I vividly recall sitting on the edge of our sofas, mom and me, waiting for a moment of magic from Adnan Al Talyani (UAE Legend, UAE Player of The Century). And then in the 47th minute a moment of magic came, not from Talyani (Legend etc.) but Khalid Mubarak (Firefighter from Dubai). Who took advantage of a spot of bad defending, and scored a really fantastic goal. Boss, we lost our minds. Mom and I just completely and utterly lost our minds. We were bouncing off the walls. Hugging. Punching the air. UAE had scored! UAE HAD SCORED. AGAINST GERMANY! Twenty-eight years later I still remember that moment quite well. Was mom wearing a nighty with little blue flowers? Yes, I think so. Or at least I think I remember that moment very well. I try hard to remember it. Periodically I tell myself: do not forget that moment. Save it. Stash it away. The goal. The moment. The celebration. That is because two and a half weeks later, on the 4th of July 1990, my mother had a heart attack. That morning we were on our way to the airport, to catch a flight to Trivandrum. We were going on NRI summer vacation trip to Kerala. All the luggage was carefully placed in the dickie of a friend's car. Mom came hurrying down the stairs. And just as we were about to step into the car, she said she felt ill. Dad told my brother and me to wait in the little Malayali hotel nearby and rushed her to hospital. She didn't make it. She passed away in the car. Nobody knows exactly what happened. Perhaps it had something to do with her thyroid problem. The next few days are a blur. I remember very little of it. I recall our house being full of people. Everyone was talking all the time. Because, I think, that is how Indian families cope with stuff. They talk and talk. First, they talk of the tragedy of it all. Then they talk about funny memories and laugh until no one can stand it any more and then everyone cries. And then when everyone is done crying, they talk. And then they eat. They eat all the time. At some point, someone came and told my brother and me to go play. Something. Somewhere. Don't just sit here and watch the grown-ups. Someone went and bought a toy helicopter for us. The only problem was you aren't supposed to play in a house in mourning. So eventually someone suggested we could sit in the bathroom and play. And that is what we did. We played with our helicopter in the bathroom. Four days later we were in Kerala. Driving around inviting people for the funeral. At some point, late in the night, we were driving back home when the driver of the Ambassador taxi suggested we drop into his house. "It is the World Cup Final," he said. "You can't watch it in your home because of the mourning. But you can watch it in mine." So we sat in the driver's house and watched that very bad, very very bad, final. Almost as if the football too was in mourning. I like football for many reasons. So many reasons. Last night's free kick, for instance. But I am also thankful to football for one very important memory. There are many different ways in which we remember someone... for the last time. In which we capture a snapshot that we will then carry with us till we run out of snapshots ourselves, so to speak. And UAE's goal against Germany in 1990 is a moment I will carry with me forever. Anyway. Enjoy the world cup. You never know when you'll need the football to help you remember. And England will win. Mark my words. Other people have lucrative investment portfolios, expensive cars, high metabolisms, statuesque physiques, healthy BMIs, and a capacity to sleep on planes during long flights. Very good. Congratulations. But I have hair. Quite tremendous hair. My hair is thick and dark and even. There is, I admit, the occasional grey strand. One cannot resist the ravaging of time, but one can succumb to it with style. But otherwise, my hair is really quite exceptional. Apply a little Brylcreem—Red—and it will stay in place like a Studds helmet. No wonder attractive ladies in business school used to run their fingers over my head and whisper ‘So dense, so thick’. Many still want to, but their bald husbands will get jealous, what to do. What happened in 1989, all those years before the 2014 elections, for my hair to suddenly move from left to right? Friends, please sit down, it is a short but good story. It was, if I recall, a Thursday morning in Abu Dhabi. Thursday was the first day of the weekend in those days in Abu Dhabi. Dad was getting dressing in his Thursday casuals for work. Mom was in the kitchen experimenting with some recipe from Vanita magazine no doubt. Chicken sambar or pineapple puffs or some such nonsense. My brother was watching some WWF wrestling on TV. And I was lying on the floor of the living room, propped up on my elbows, reading the newspaper. I was 10 years old at the time, my brother was six. I was a 10-year old who spent most of the weekend reading the newspaper. I was, and still am, considered to be a very cool person within very limited social circles. As I was reading the paper or doing the crossword or some such, I noticed a toothpick lying under the sofa. I remember this very distinctly. It was inside a Kentucky Fried Chicken wrapper. Perhaps the remains of a weekend fast food meal the evening before. For reasons I just do not have, I reached for the toothpick, unwrapped it, and began to just look at it. Why? No idea. I just said no, boss!! I have no reasons. At that exact moment my brother leapt off the coffee table and onto my back like some stupid WWF wrestler. He was so enthralled by the program on TV he had decided to produce what I believe is called ‘user-generated content’. For a moment I was just mildly irritated. And then I saw the drops of blood on the newspaper. And then I noticed that the toothpick was no longer in my hand, but sticking out of my head, near the hairline on the right side. (My right, your left.) Panic ensued. I tried to pull it out, the toothpick broke in half, leaving around an inch still embedded in my head. I ran to the bedroom. Dad, I said, there is a toothpick in my head. Shut up Sidin, Dad said, don’t make fun of such things. One day it will really happen and then nobody will believe you. Dad, oh my god Dad, Dad there is a toothpick in my head. This is not a drill. My dad ran his fingers over the skin of my scalp and recoiled in horror. The inch-long piece of toothpick was stuck between the skin of my scalp and the bone of the skull. All this is completely true. Completely. One doctor came and checked and said, wait one second I need to call another doctor. Then another. And then another. Until there was a small group discussion around my head. The problem, they said, was trying to figure out how to approach the piece of toothpick. Apparently, the foreign object was moving around between the layers of skin and bone. After two or three hours of this nonsense, they finally decided to operate. The operation itself took no more than an hour or so. There was a lost of unpleasant tugging and pulling and stitching. Did it hurt me? Well, I don’t have any strong feelings about that question... because they used local anaesthetic. After applying a massive—and I mean massive—bandage around my head they said I could go home. The doctor asked me if I wanted to go to school the week after. Of course, I said, I am participating in a poetry recitation competition. This proved futile as that stupid Andrew M with his voice like melted Amul butter sliding off a silver spoon into a pool of melted chocolate won the contest. (Bloody fool won every single year throughout my time in that school.) I got third prize I think. The stitches and scarring meant that I had to switch my hair partition from left to right. For years afterwards I used to impress people by showing them the scar in my hairline. This scar has now vanished. But I don’t need it anymore. Why would I need it? I have my fantastic hair. And people are always impressed. My new book is out soon. Pre-order now! In Switzerland, a woman collapses in the arms of an Indian journalist, her body disintegrating into a puddle of gore. She is the first victim of a monstrous disease that will soon kill hundreds with relentless fury . . .
Who will it kill next? Unsuspecting men, women and children are ravaged by a killer that experts have never seen before. As the outbreak wreaks its bloody havoc—killing rich and poor, young and old—thousands try to flee . . . including the most powerful man in India. 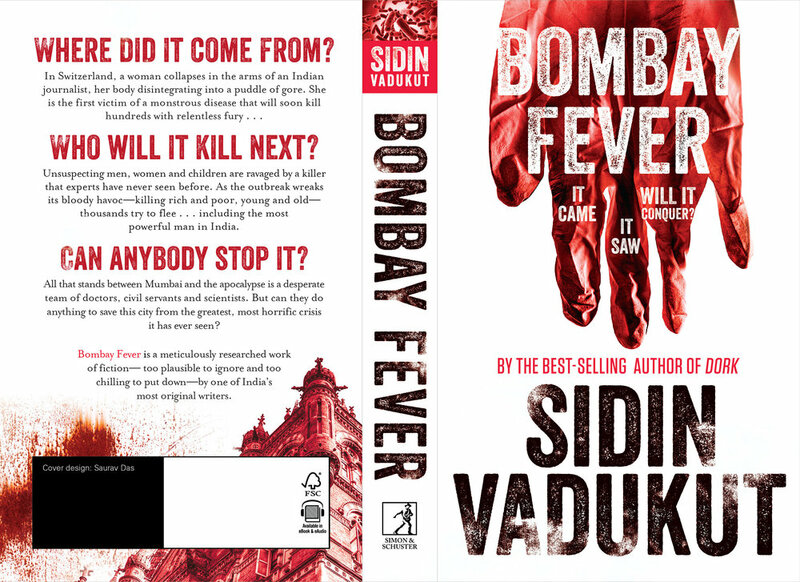 All that stands between Mumbai and the apocalypse is a desperate team of doctors, civil servants and scientists. But can they do anything to save this city from the greatest, most horrific crisis it ever seen? But these days, when the weather is beginning to get a bit warmer and then sun a bit more forthright, I step outside and sometimes just stand there listening to the birdsong. Birdsong, I suppose, is a bit like love or hunger. You don't notice it until you do. And then you notice nothing else. A few weeks ago, now that life seemed to have returned to a semblance of normalcy, I decided to go and see my local club play football. Frequent visitors to this blog will recall that once upon a time I used to live right outside Arsenal's Emirates Stadium. I now live a twenty minute walk away from Bomley FC's Hayes Lane ground. It is impossible to exaggerate the difference between the two venues. This plan had been forming in mind for many, many weeks. What greater sign of commitment to your local community is there than to go and see the local football team play in the fifth tier of English football. Bromley FC play in the Vanarama National League. Arsenal play in the Premier League. Then there is the Championship, League One, League Two and the National League. Confusingly enough the National League is what many people here call 'Non-league Football'. Because it is semi-professional at best, and a bunch of barbers and school teachers and accountants at worst. The club, however, was coming off a somewhat bad run of form. They had just lost 4-0 in their previous game. And I was hoping my presence would perk things up. After all, in seven years of watching Arsenal play live at the Emirates infrequently, my club has won every single time. Really. It is a great record. Then Bromley's Lee Minshull was sent off in the 16th minute. In the 32nd minute Bromley's Daniel Johnson was also sent off. And in the ensuing brouhaha Bromley manager Neil Smith was also dismissed. One minute later Bormley conceded another penalty. 2-0. And just before half-time Braintree scored again. 3-0. At half time I walked over to buy my burger, fries and tea in a mood that can only be called "Bencho yeh kya ho raha hai". I was fully expecting to come back to my seat for the second half expecting to find the crowd in a violent mood. Instead I spent the next 45 minutes enjoying exquisite gallows humour. Resigned to humilation, the Bromley FC fans were indulging in some comedy to somehow get through the next 45 minutes. Memories of IIT-JEE papers came flooding back. Braintree scored twice more by the 73rd minute. When the final whistle was blown some fans stayed back to applaud the Bromley players back into the tunnel. The referee walked away to resounding boos. I applauded and booed respectively, had another drink, and then went back home. And then after thirty minutes of waiting for the missus to stop laughing I went to bed. Bromley are playing at home again on the 25th.